XLT Special Edition Package! Sport Package! Panoramic Roof! A thoroughly modern full-size pick-up, our award-winning 2016 Ford F-150 XLT SuperCrew Sport 4X4 is proudly presented in Lithium Gray! Powered by a Twin TurboCharged 3.5 Liter EcoBoost V6 offers 365hp while tethered to a durable 6 Speed Automatic transmission with Sport and Tow/Haul modes. You ll dominate the road with incredible towing and payload capacity in this Four Wheel Drive while scoring near 22mpg on the highway! Our Sport is one sharp-looking truck with its Black billet-style grille with body-color surround and Black mesh insert, Sport box decal, and prominent alloy wheels. You ll be comfortable inside the well-thought-out XLT cabin with clever storage, power accessories, and cloth seats. Stay safely connected thanks to Ford s Sync voice control smartphone integration system, while taking advantage of Bluetooth phone/audio connectivity and USB/auxiliary audio input jacks. Now buckle-up and enjoy this solid, composed ride! 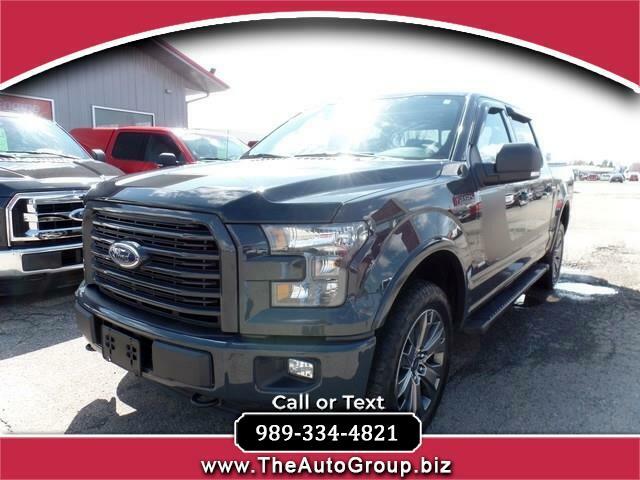 Drive with confidence knowing this is a lean muscular Ford with a high-strength military grade aluminum-alloy body and high-strength steel frame. You ve also got anti-lock disc brakes, stability and traction control, trailer sway control, front-seat side impact airbags, and full-length side-curtain airbags to help keep you secure. Tried and true, this reliable truck is an incredible choice! Get behind the wheel of our F-150 today! Print this page and call us Now... We Know You Will Enjoy Your Test Drive Towards Ownership!